Strongly and positively engaged communities are key to successful coastal adaptation to climate change and sea-level rise. 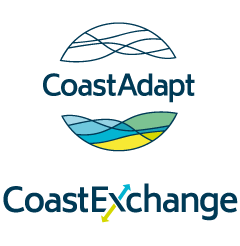 Coastal adaptation requires that a wide range of stakeholders be engaged in understanding and scoping the risks and opportunities, and evaluating potential solutions. These stakeholders may have different values, aspirations and beliefs. Therefore it is unlikely that they will land on common solutions. The goal of community engagement is to land on consensus solutions that are broadly acceptable to all, including householders, businesses and government. Involving the community is time consuming and expensive in terms of human and even financial resources, but so are the consequences of not involving the community. Successful community adaptation to climate change requires strong and positive community engagement – not just around specific adaptation activities but also to help develop a broader vision of a desirable future for the community. For coastal communities, adaptation to coastal hazards is a challenge that can be hard to define because there are many different interests in the coastal zone and each of these interests would define the challenge differently. How the challenge is defined helps to shape any potential solutions— and vice versa as any desired solution by a party helps to shape their understanding of what is the problem. Therefore it is important to involve a broad section of the community to build understanding of interests and aspirations, as well as to canvas views and ideas of potential and acceptable solutions. The best way to do this is through a participatory and adaptive process that involves a broad section of the community as partners in the process and that helps to map out an understanding of community values in terms of what matters most and what trade-offs are acceptable. When we talk about the community we are talking about many different individuals and groups loosely tied to a place through networks, interests and social norms. Within a community there are diverse attitudes, aspirations, worldviews and behaviours. This spectrum of views needs to be accommodated when working with the community. Consultation is expected in a democracy. Consultation can broaden the understanding of the problem and potential solutions and learning. Effective consultation can build relationships and trust. People expect to have a say: Given that we live in a democracy, people expect to have a say in what happens in their community and their country. Therefore they expect to be consulted in big and small ways. While governments ‘consult’ through the ballot box every three to four years, they also are expected to consult over specific initiatives as a means to hear from and inform the community and to test and refine ideas. All tiers of government have policies and guidelines about how they will engage. (For more detail see the Information Manual 9: Community Engagement – Section 3). Consultation on adaptation to climate change is particularly important (and also made more difficult) because climate-related impacts may seem uncertain or intangible and the real need to act may seem to be in the future. More knowledge, more ideas: Consultation can broaden the discussion to expand the understanding of the issue, as well as expand the number of potential responses. Through consultation, individuals and groups are able to provide their knowledge and views, hear and acknowledge the knowledge and perspectives of others, and have the chance to learn new information and modify or alter their views. The community is likely to experience changes and so can be a source of information on impacts. While scientists have a role in forecasting and monitoring the impacts of climate change, the community plays a role in verifying those changes in their area. Local individuals also understand the local social and economic situation which means they can have ideas about what actions or policies might work but also, given they have to live with the decisions or changes, they are also likely to have concerns that need to be aired. The challenge can be to get broad and sustained engagement across the diversity of the community, rather than intense engagement by powerful interests or those directly affected by coastal hazards. strong leadership supported by cohesive governance and collaboration amongst coastal institutions. These widely agreed characteristics could be used as the basis for building a broad common vision to be worked towards. Build relationships and trust: Genuine engagement builds relationships—and therefore trust— to support equitable decision-making processes and collective responses. Building trust is important for adaptation as people are more likely to support change if they have trust in decision-makers and have been involved in the decision-making or perceive that the decision-making process has been fair and equitable. Community consultation and engagement requires a holistic approach. In the Information Manual 9: Community Engagement we offer some guidance for involving the community in adaptation. We also give suggestions for how you can Build support within your organisation. Involving the community is time consuming and expensive in terms of human and even financial resources, but so are the consequences of not involving the community. Councils and organisations must recognise the need, and develop the skills and capacity, to build broad community support – or at least understanding and acceptance – of the broader vision for the future of their coast. Moser, S. C., Jeffress Williams, S., and Boesch, D. F. 2012: Wicked challenges at land's end: Managing coastal vulnerability under climate change. Annual Review of Environment and Resources, 37, 51-78.